You can’t get around it. CME marketing can be difficult for even the most experienced CME directors. First, there’s the creative aspect—your marketing messages must be crafted to engage, inform, and inspire your audience to act while maintaining a unique brand voice. Then there’s the not-so-small matter of your audience. Are you targeting the right one? Is your marketing strategy helping you attract new learners or are you just preaching to the same, relatively indifferent choir? Is anyone even listening? Successful CME marketing is always data-driven. Understanding which data matters and how it applies to marketing strategy is critical to the development of a winning campaign. In this post, we’ll walk you through five ways to enhance CME marketing using historical data. Then, we’ll show you the easiest way to get your hands on that data and take care of your biggest analytics challenges once and for all. Without data-driven insights, campaign messaging invariably misses the mark— regardless of the platform or medium that you may use. That’s because the clues to which messages your audience will respond to are tucked away in your data. Those metrics within your data—such as course completion rates, learner assessment scoring, and even email responses—represent patterns which may show you how, for example, a change in your curriculum may have impacted learner performance and/or satisfaction over time. Whether you’re attempting to reach a new audience or engage existing learners, your historical data will help you to assess learners’ educational needs and determine which students may be open to new educational programming. If you want your marketing campaign to resonate with learners, your messages will have to be crafted in the language of their professional and educational needs. Here are 5 ways to leverage historical data to build a powerful marketing message that inspires your audience to come and learn. If you find that over time new learners are consistently struggling with certain concepts on pre-activity assessments, these areas are a good focus for your marketing campaign. When creating content and marketing copy, stress your program’s emphasis on the specific knowledge areas that your audience may view as the most challenging. Focusing on the general quality of your program–rather than learners’ need to master high-demand topics or develop specific competencies—won’t highlight your program’s unique value to your audience. Your historical data will also tell you if your learners find the structure and presentation of activities a help (or a roadblock) to the learning process. This may be indicated by course completion rates and/or help desk queries about user experience issues. It’s essential to drive home the fact that your association takes great care to create a positive user experience that is designed to enhance the learning process. While students care about rigor, they also want to know that their educational provider cares about their experience, as a learner, in addition to educational outcomes. Once you’ve gleaned critical insights from your historical data (we’ll show you how below if you’re not sure where to start), you can begin to segment your audience and develop messaging that speaks to the specific educational needs of each group. While it may seem like audience segmentation is a practice that is more suited to very large CME programs, even smaller organizations can benefit from identifying groups of potential new learners based on historical and new data. If your CME program is offering a course on new medical technology, for example, you might direct a different marketing message to new doctors than you would to chief residents. Each group will need your course to become conversant with a new medical advance, but their reasons for doing so may be vastly different. Employ the insights yielded from your historical data to find out why your students want to learn (in addition to what their interests are) and use these insights to tailor your message to their goals. The easiest way to get your hands on the historical data that you need to craft a winning campaign is to use a software-as-a-service (SaaS) platform that offers integrated data collection, warehousing, and analytics. EthosCE Analysis is an enterprise-grade analytics suite that is included with the EthosCE CME management platform. EthosCE Analysis gives you a comprehensive view of historical and real-time data—on everything from course completion rates to per-question learner assessment performances—through customizable dashboards which let you generate detailed data visualizations with one click. With EthosCE Analysis you won’t have to dig through your data manually to find an insight to guide your marketing strategy. Did I identify my targeted audience based on historical and current data? Did the content of my campaign differentiate my program’s areas of educational expertise from those of our competitors? Did I identify specific knowledge gaps that our program addresses? Did our campaign give an example of how our learners’ user experience is top notch? This is another simple but powerful idea. Your highest performing learners have the potential to become your best brand ambassadors. Reward students who are deeply engaged with their courses for their hard work with exclusive content or other perks as they complete activities. Don’t make their rewards dependent on them inviting friends to register for a course—focus on developing a relationship before asking for a helping hand in getting the word out. This will drive home to your students the message that their educational experience comes first, even before your marketing strategy. As your high performers complete their courses, encourage them to relate their experiences (rather than just rating your course) via a survey for the opportunity to be featured on your social media pages as a success story. Rather than promoting a transactional relationship between your association and potential influencers, an invitation to share their educational outcomes keeps the focus on their learning experience, not your marketing goals. We already know that up-to-date demographic and email response rate data are essential to the development of a campaign that resonates with a targeted audience. But how can you be sure that you have the right data to enhance your marketing campaign? Unless you have access to a full portrait of course and learner behavior data over time, your long-term marketing strategy will be based on guesswork. Data-driven insights into the changing requirements of your existing and prospective learners can take the most challenging work out of outreach, allowing you to focus on meeting educational needs. By combining real-time and historical data and presenting it through easily customizable dashboards that generate rich data visualizations, finding relevant insight is effortless. EthosCE releases your data from its silos and presents you with the insights that you need to build a successful marketing strategy and laser-targeted campaigns. By combining real-time and historical data and presenting it through easily customizable dashboards that generate rich data visualizations. 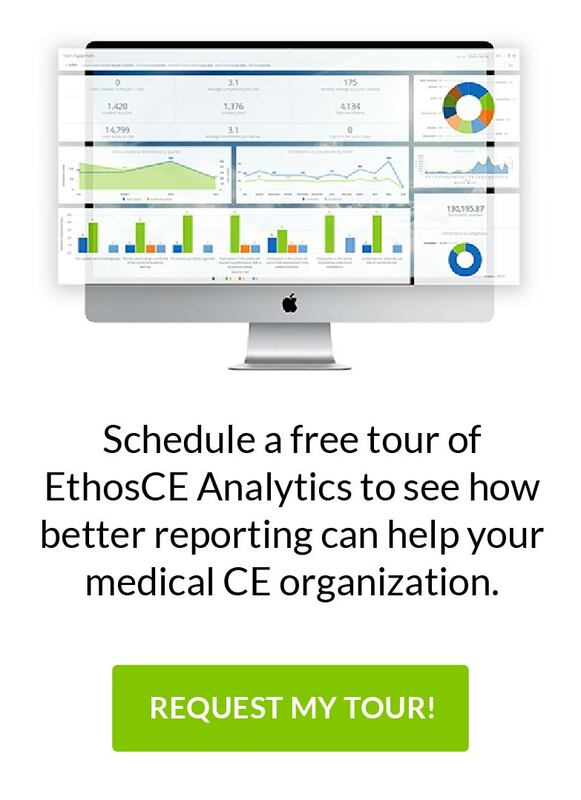 EthosCE analysis makes finding relevant insights effortless and is designed specially for medical CE, with over 16 years of experience in the field. We’ve helped many associations and universities make the switch to our easy-to-use LMS. Leave Work On-time With the Very Best LMS for Medical CE! Why the Less FAQs the Better. Enhancing Medical Member Experience.